This article first was published as a guest post on The Christian Science Monitor blog Modern Parenthood on May 20, 2013. Every year, ancient sea creatures resembling miniature armored tanks invade East Coast beaches with one mission — lay and fertilize as many eggs as possible before disappearing back into the sea. For three nights, curious onlookers will have the opportunity to witness one of the oldest mating rituals in the world as scores of horseshoe crabs scuttle up onto the shores of Delaware Bay, Cape Cod, and the coastal beaches along the East Coast. The horseshoe crab, officially known by its scientific name, Limulus polyphemus, has been making annual pilgrimages out of the sea for hundreds of millions of years. Most wait for the full and new moons of late May and June to perform their mating dance. This year marine biologists expect that the biggest horseshoe crowds will emerge on May 24, June 9, and June 23. 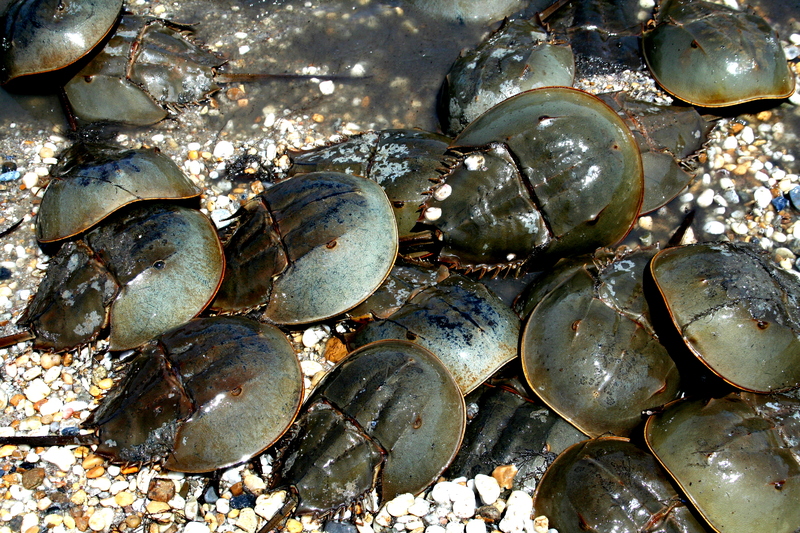 While some horseshoe crabs come ashore during the day, the majority will wait for the cover of night. Then, scores of them will emerge from the sea to begin their moonlit dance on the beach. The females will come first, many with males already in tow in search of a bit of sand to lay their eggs. The females are considerably bigger than males to accommodate the thousands of eggs beneath each helmet-like shell. The females dig nests in the sand before they drop off their young and return to the water. The males pace back and forth over the nests, fertilizing as many eggs as they can before they too return to the cool shallows of the water. For families interested in gaining a front row seat to the show, Delaware Bay is the world’s largest spawning ground, but they have been spotted up and down the east coast. Citizen scientists can report sightings online to the Ecological Research and Development Group. InDelaware and New Jersey, volunteers can help count the horseshoe crabs as part of a survey during the several weekends this spring and summer. Some horseshoe crabs have already been tagged as part of monitoring projects conducted by the US Fish and Wildlife Service. If you come across a horseshoe crab with a circular or square white tag attached to the corner of the shell, make note of the number on the tag and report it to the US Fish and Wildlife Services online or by calling 1-888-LIMULUS. Not really a crab at all, Limulus polyphemus is actually an arthropod and is more closely related to scorpions and spiders than any crab. Limulus is a favorite species for marine biologists and teachers to share with children. The helmet-shaped shells, or carapaces, that protect them from predatory birds in the wild also make them hardy enough to thrive in aquarium touch tanks. While their blade-like tails may look menacing, they serve solely as a rudder for steering in the sand and helping the horseshoe crabs to right themselves should they become overturned by the tide. Observant beachgoers may come across the discarded shells of horseshoe crabs that have outgrown their carapace and molted. These ghostlike shells can be great fun for kids to explore. For families that cannot get to the shore, there are many non-fiction books for children describing these prehistoric creatures. Children’s book author Ruth Horowitz offers some moonlit magic in “Crab Moon”, a picture book illustrated by Kate Keisler and recognized by the National Science Teachers Association as an outstanding science trade book.